We all want a beautiful garden, but often the effort required in maintaining that lovely landscape is just too much. Watering, weeding, deadheading, and pruning can take hours and hours. Most of us are already busy with jobs and chores and kids and errands. Not everyone has enough spare time to devote themselves fully to a garden, and quite often you’ll want to minimise the necessary maintenance. But despite this, we do still want to benefit from a carefully maintained garden and make the most of it when we do get time to relax. Here’s advice on how to best create a low maintenance garden. The maintenance of a lawn is often one of the more time-consuming jobs in a garden, requiring weekly mowing during the summer and regular edging. Consider reducing the size of your formal lawn area and allow part of it to ‘go wild’ allowing flowers and grasses to thrive. If you prefer a more manicured look, consider replacing fine turf with harder wearing turf mix described as an amenity, multi-purpose, hard wearing or low maintenance. ”If you have little or no time to keep the grass in check, there are a number of options you can pursue that will notably cut your gardening time down. For those who still want to keep grass in their garden, perhaps cutting back the size of your lawn could be just what you need. A more manageable area to keep maintained is much less daunting and will reduce time spent cutting the grass significantly. With little to no maintenance required, artificial turf is perfect for those who want to still experience a beautiful green garden without the constant maintenance of keeping a traditional grass lawn. They require no cutting, don’t get muddy through regular use and maintain an immaculate and hard-wearing appearance at all times. They may not be for everyone, but artificial turf definitely has its place in modern gardening. We only use the highest quality artificial grass and provide a wide range of styles and designs. You will be able to work closely with members of our team to choose the right style to fit your particular needs. Because we have such a wide selection, we can provide artificial grass to individually owned homes from small garden areas too large landscaping projects, and everything in between. Hard landscaping and patio design are considered the backbone of any garden design. You are always taught to design the structure and then fill the voids with the soft stuff and as turfing is soft stuff, this should be brought into the latter part of the design. Patios have their own beauty in the natural stone, the huge variety in texture and the pure ability for its surface to heat up and change colour in the sun. Patios should serve a practical purpose yet fit in with its surroundings. Consider a contemporary style – this clean and minimal look requires far less maintenance than say, a cottage-style garden. Decking is a welcome addition to any low maintenance garden; it lets you get closer to nature and relax, and can be built to any height and size without the need to mow and weed. You can opt for softwood or hardwood decking; the former experiences build-up of moss and water, meaning it requires more regular cleaning, but is cheaper than hardwood. It really depends on your budget and your time. Composite decking is designed for maximum durability. It resists fading, staining, scratching and mould, and won’t rot, crack or warp. It’s also insect-proof and splinter-free, making it safer and more comfortable for families with kids and pets. 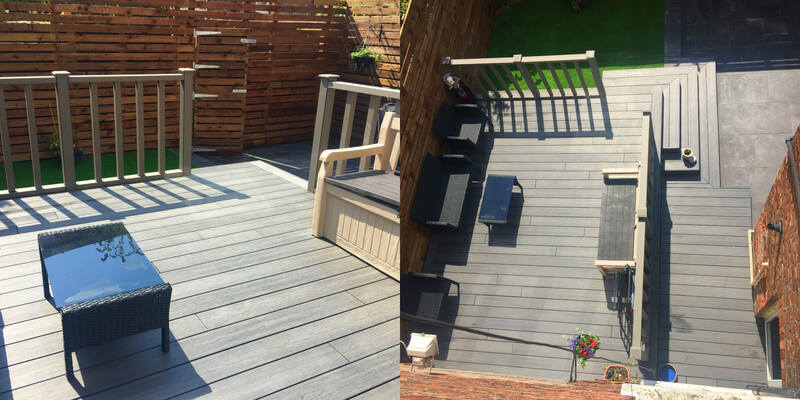 With composite decking, you never need to worry about sanding, staining or painting. Just an occasional soap-and-water cleaning is all that’s needed to maintain stability and beauty for decades.